It seems like everyone I know is jumping on the clean eating band wagon. The one thing that keeps coming up in our conversations is how expensive it is. You can walk into the supermarket and fill a cart full of crap for $50, but that same amount will barely cover the bottom with fresh fruits and vegetables. It's totally not right, but one of the tricks I've learned to help combat the cost of healthy eating is to buy items that are in season. No matter if you are in the height of summer or the depths of winter, something will be growing. This means that those items are abundant, which in turn means they are less expensive. Take my Sausage and Herbed Quinoa Stuffed Acorn Squash for example. To begin you will need to preheat the oven to 400 degrees. 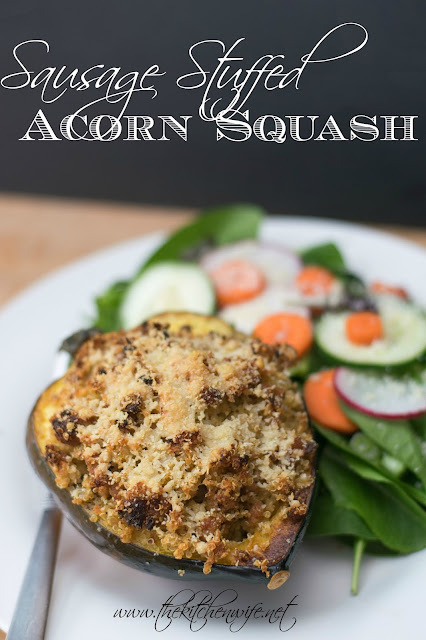 While the oven is preheating you will need to prepare your acorn squash. First cut in half from top to bottom. Then use a spoon to scoop out the seeds and gut. I just throw those away, but you can roast the seeds for a healthy snack later. Now drizzle a little extra virgin olive oil over the squash halves. Then gently rub it all over the inside of the squash. Once you have done that, you will need to season them with salt and pepper. When the oven has reached 400 degrees place the squash, cut side down, onto a baking sheet and bake for 20 minutes. While the squash is baking, place a pan over medium/high heat and add a little extra virgin olive oil. As the pan is heating up you will need to remove the turkey sausage from it's casing. And before you ask, yes, you can use regular Italian sausage. I like using the turkey sausage because it is a leaner protein, which makes it a little healthier. Now that the pan is hot you can brown the sausage until it is fully cooked and no longer pink. and rosemary to the pan. Let it heat through for 1-2 minutes in the pan to bring those herbs to life. Now you can assemble the stuffing! Place the fully cooked sweet Italian turkey sausage into a large bowl. Then add the quinoa, bread crumbs, and parmesan cheese to the bowl. Now you can add the beaten egg. Mix everything together and your stuffing it ready to go! After your squash has been in the oven for 20 minutes, remove it and flip them over. I actually placed my into a smaller baking dish because, well, I intend on stuffing these little beauties to the sky and I didn't want them falling over. Now scoop the stuffing into the wells in the center of the acorn squash. Pack these babies sky high and if there is any stuffing left over, put it in the bottom of the pan. Trust me, none of that goodness is going to waste. One final step before they go back into the oven, sprinkle a little more Parmesan cheese over the top because why not. Place them back into the oven for 20 to 25 more minutes. I wish I could describe in words how amazing the smell of these mouthwatering morsels baking is like. My entire how was wafting with fall! After they are finished baking you are ready to serve! The best part, this meal feeds two people for around $5. 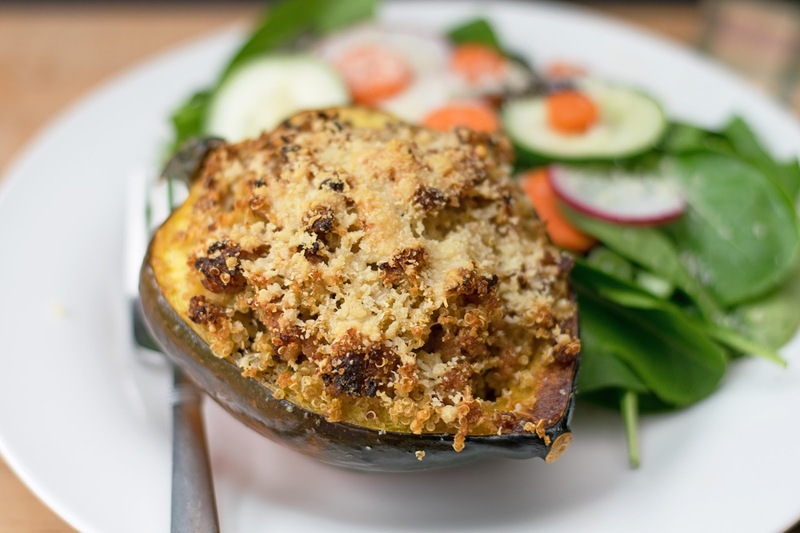 I promise you though, the flavor of these Sausage and Herbed Quinoa Stuffed Acorn Squash is anything but cheap. It will have your family begging for seconds, and you know what, that's totally okay because this dish is super healthy and full of great nutrients! Since this is a richer, heavier dish, I like to serve it with a nice garden salad. The fresh greens adds a crips lightness to everything to help balance it out. So don't let the cost of healthy eating discourage you from trying. Simple tricks like shopping seasonally can make is less expensive without sacrificing taste. So get in the kitchen and give this recipe a try tonight! And if you would like to hear more about my money saving tip in a future post, let me know in the comments below! Cut the squash in half from top to bottom and scoop out the seeds. Drizzle extra virgin olive oil over the inside of the squash and season with salt and pepper. Place the squash cut side down on a baking sheet and bake for 20 minutes. While the squash is baking, remove the turkey sausage from the casing and brown over medium/high heat until fully cooked. To the fully cooked sausage add the sage, thyme, and rosemary. Let cook for 1-2 more minutes. Place the cooked sausage into a large mixing bowl. Add the quinoa, bread crumbs, and parmesan cheese, and beaten egg to the mixing bowl. After 20 minutes remove the squash from the oven. Turn the squash over and fill with the stuffing. Sprinkle a little Parmesan cheese over the top and return it to the oven for 20 to 25 more minutes.